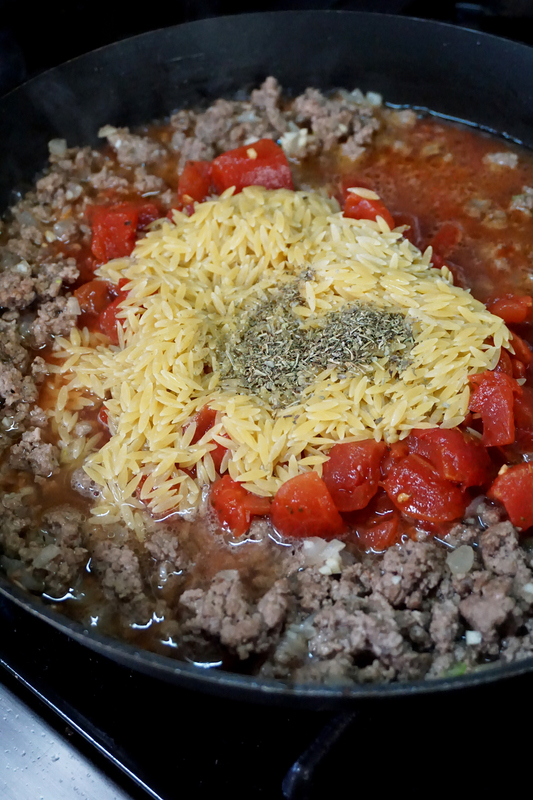 - 1-14.5 oz can of diced tomatoes - Note: I recently made this 2x since posting this recipe. I was lured by a 2/$1 deal on Safeway Diced Tomatoes. Don’t do it!! It completely changed the taste of this meal. If you can, use S&W Italian Recipe Diced Tomatoes. - Dice half a yellow onion and 2 cloves of garlic. - Grab a large skillet and heat it over medium heat. Dump in the diced onions and ground beef. Usually I like to brown the onions first, but you don’t want them to be too mushy when the dish is finished. - Break down the ground beef with a wooden spoon. I like to break down ground protein super small and cook it gently - this keeps it from becoming tough and dry. Season with salt & pepper. - You’ll notice that I didn’t use EVOO this time. The ground beef will render off some fat. Feel free to tip your skillet to one side and scoop it out. This will help keep the pasta from getting too oily. 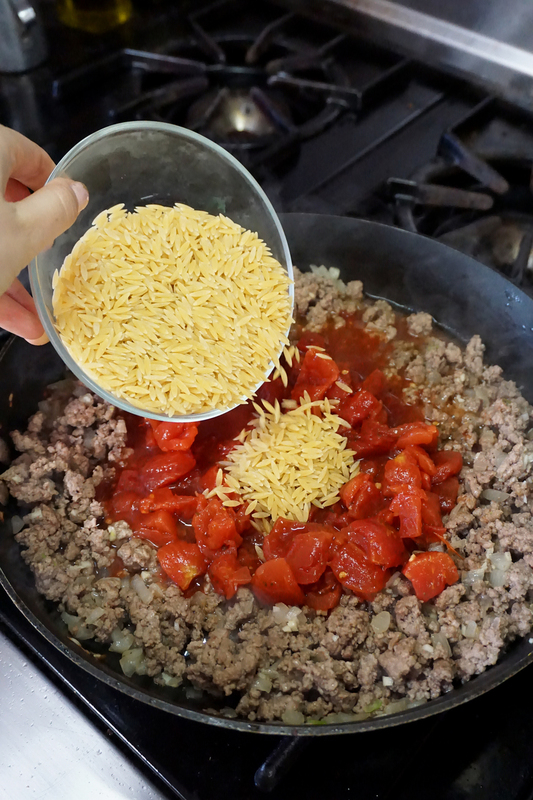 - Once the ground beef has browned, dump in the diced tomatoes and their juice, the orzo, 1 cup of chicken broth, water, and Italian seasoning. - Stir it all together, cover it and let it simmer for 10 minutes. Check on it every so often and stir it so that the orzo gets enough contact with liquid, and also doesn’t stick to the bottom of the pan. Check for seasoning. Usually you’ll need just a dash of salt and a crack of black pepper. If you feel like the orzo needs more liquid, add more chicken broth as it simmers. - Once the orzo is cooked thru, dump in all your spinach! It’ll wilt quickly. Stir to incorporate..and guess what? You’re done!!! 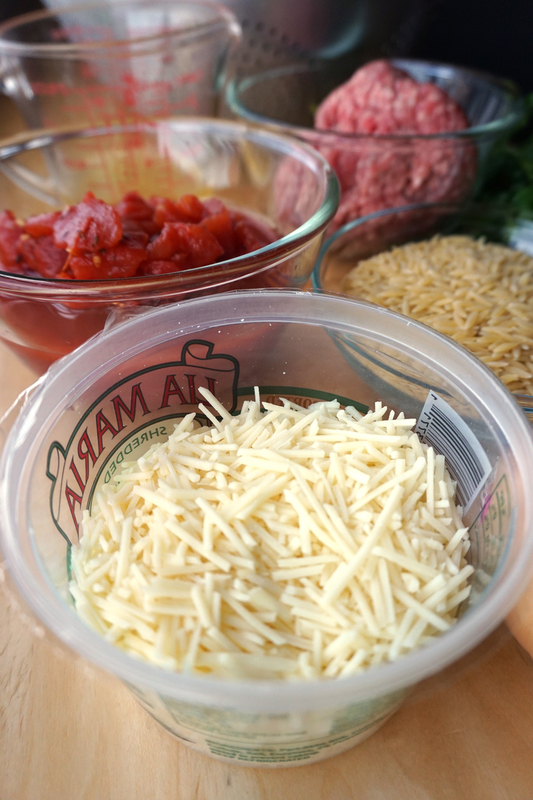 Serve with tons of grated Parmesan and be ready for your eyes to roll backwards into your head lol. It’s so cozy and delicious!!! My favorite part about this dish is how light it tastes. The tomatoes coat the orzo but don’t weigh it down, and the spinach makes every bite feel really well balanced and fresh. I just love how easy it is to make! This pasta comes out creamy and delicious without any unhealthy ingredients. I hope you try it :) And if you do, let me know! :) Have a great week!